Well, according to data compiled by CompStak and others, the Wall Street Journal reports that high-end, premium space has been growing in popularity in the first half of this year. Asset management and financial firms, basking in the glow of a few prosperous quarters, are taking the plunge on deluxe office spaces with rents greater than $100 PSF in the more sought-after neighborhoods of Manhattan. Read more below. By CARMEL MELOUNEY Premium space in Manhattan's trophy office buildings is once again in strong demand, with an acceleration of lease deals going for more than triple-digits on a square-foot basis in the first half. The high-end deals topping $100 a square foot reflect that sectors of the city's financial-services industry, such as hedge funds and private-equity firms, are doing well again. This year has already seen 35 deals with rents above $100 a square foot, compared with 41 such deals in all of 2012, according to research from Colliers International. At the peak of the market in 2007, there were 113 $100-plus deals on a square-foot basis, with the total falling to just 17 in 2009. This leasing activity so far has involved just 17 Manhattan buildings. 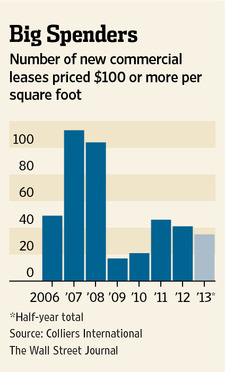 In 2012, 23 buildings saw new leases at prices topping $100 a square foot. Trophy towers such as the Seagram building at 375 Park Ave., 9 W. 57th St. and 510 Madison Ave. have always been attractive to financial-service companies. But there has been an uptick in this activity as their business results are improving and as this premium office space has become tighter. "As we went into the big recession, these big $100 deals dropped off the cliff, but now smaller boutique financial firms, as the equity markets have rallied, are doing well," said Alan Desino, executive managing director of Colliers International. "The 1% do extremely well, and they all seem to like similar niche properties," Mr. Desino said. A report by Preqin, a data firm that tracks alternative investments, said the second quarter was the strongest period for private-equity firms attracting investments for their funds since the fourth quarter of 2008, with an aggregate $124 billion raised by 164 funds. There were leases for 14.5 million square feet of Manhattan office space signed in the first half, up from 12.4 million square feet in the first half of 2012, according to Colliers International. 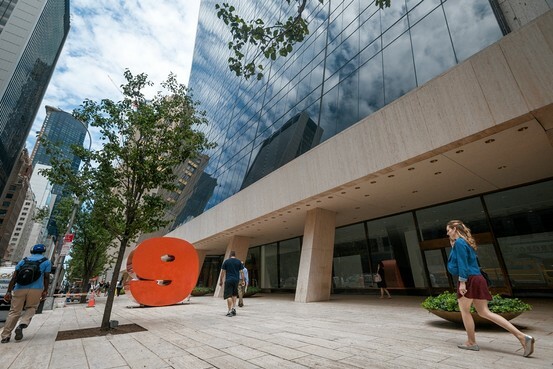 At the end of the second quarter, Midtown North had a vacancy of 7.2% and an availability rate of 12.3%, while the district near the Plaza Hotel had a vacancy rate of 6.7% and an availability rate of 11.7%. The vacancy rate refers to unoccupied space; the availability rate refers to space that is available to be sublet or that is coming up for lease. Real-estate data firm CompStak says triple-digit deals this year include one by Och-Ziff Capital Management at 9 W. 57th., a trophy building in the Plaza district owned by Sheldon Solow. Och-Ziff Capital Management took 32,000 square feet on the 13th floor at $100 a square foot and also took 63,200 square feet on the 39th and 40th floors of the same building for $210 a square foot, CompStak said. Other big deals in the first half include Brazilian Bank Itau's 16,000-square-foot deal at 767 Fifth Ave. starting at $195 a square foot, and the Ontario Teachers' Pension Plan signing a 3,000-square-foot lease for $140 a square foot in the Seagram building, CompStak confirmed. "There's an elitist notion that they can pay it because they can," said Colliers International's tri-state chairman, Robert Freedman. "Many of these tenancies are doing it for personal convenience—these are the very people for whom personal convenience is very important." Mr. Freedman said many of these trophy buildings are lavishly appointed spaces with interior features such as pantries that resemble domestic properties rather than offices. "The implications for the broader market are psychological," said Mr. Freedman of the high-end deals. "It establishes the upper level of value in our market, and creeps into market psychology." This psychological impact is evidenced by new buildings in places such as the Meatpacking District and West Chelsea that are asking rents above $100 a square foot. 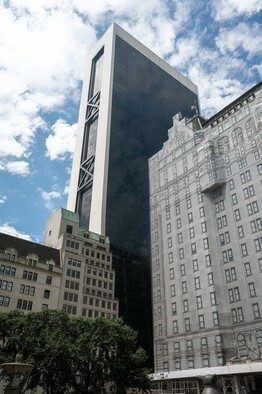 They include the Albanese Organization's 170,000-square-foot office tower at West 22nd Street, and the 50,000-square-foot office development at 837 Washington St., a venture of Taconic Investment Partners and Thor Equities. Ken McCarthy, chief economist at Cushman & Wakefield, said the amount of space at the top of Manhattan's office market is diminishing, and a lot of this year's high-end leasing activity represents growth through new leases and expansions, with very few lease renewals. "To them, the building and space serve a purpose beyond just where they operate," Mr. McCarthy said of hedge funds and private-equity firms, adding that such firms want to be associated with trophy buildings. "It's important for client relations and also for the attraction and retention of talent," he said.